Hyundai Tucson, the much awaited SUV from the South Korean car maker will finally be launched in India on November 14. At first, the Tucson was supposed to be released in this month, on October 14, but the car maker postponed the launch in order to make sure that the waiting period on the Elantra that is seeing some heavy record of bookings, does not become too long. Hyundai therefore took a decision to make the Elantra their priority for now and therefore the Tucson launch had to be postponed to November that is after the festive period. At present, the company is open for bookings for the Tucson at a down payment of INR 25,000. The new generation of Tucson was first unveiled at the 2016 Auto Expo, held in February this year. Upon its launch, the all new Hyundai Tucson will be placed between the Creta and the Santa Fe in the auto major’s Indian line up of cars. First released back in 2004, Hyundai brought the first generation of the Tucson SUV to the country back in early 2005. The SUV became quite a popular model in the Indian car market and was sold in our country for more than five years, before Hyundai finally decided to discontinue the car in 2010. The 2016 version of Hyundai Tucson has been developed on the company`s new Fluidic Sculpture 2.0 design language. Similar to other Hyundai cars, this model also gets those smooth curves around its edges that have been further accentuated by stylish elegant features like the imposing hexagonal radiator grille with chrome slats, stylish sweptback head lights, sloping roofline, a sporty front bumper, and wrap around LED tail lamps to go along with its rugged profile. 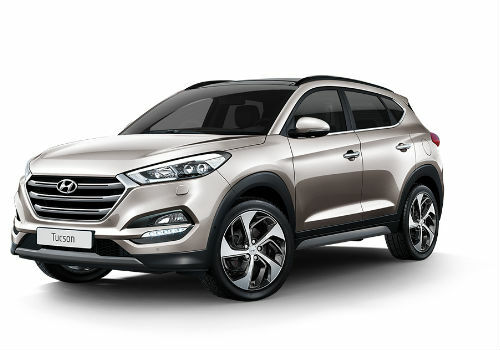 Media speculations say that Hyundai aims to attain 50 per cent localisation for the Tucson. Stepping inside the car, the cabin of the new Hyundai Tuscon comes adorned with premium leather upholstery and leather wrapping for the instrument panel as well as steering wheel. The list of features available on this car would include a touch screen infotainment system, 8 speakers, optional panoramic sunroof, and electrically operated tail gate among many others. Though the car maker is yet to come up the final details about the engine line up of the new Tucson, this grand SUV is likely to be available with a 2.0 litre diesel engine in two versions of tune. The engine will generate 134 bhp and 181 bhp of output respectively and will get both a 6-speed manual as well as automatic gearbox as transmission options. The new Hyundai Tucson will be pitted against cars such as the Honda CR-V, Skoda Yeti, and Ssang Yong Rexton. It is expected that the Tucson price will range somewhere between INR 20 lakh and 25 lakh (ex-showroom). Get the Mahindra First Choice advantage! Check Second Hand Cars in Your City! New Hyundai Santro – What You Should Know?